Companies should have a ‘Customer Strategy’ not a ‘Twitter or Facebook Strategy’. To start, first understand your customers social behaviors, below are the slides and recorded webinar featured yesterday by Charlene Li and myself. We know that customers are adopting new technologies to communicate with each other –and companies must change their own behaviors to reach them. Yet, to often, we hear of companies ‘fondling the hammer‘ where they have knee-jerk reactions to which ever technology emerges. The problem with this strategy is that new technologies are emerging in rapid iterations due to low-cost of innovation. 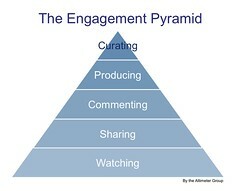 As a result, focus on their behaviors, which we cover in detail in the Engagement Pyramid. While using surveys is an effective way of getting a strong baseline set of knowledge, you must be constantly monitoring and updating the changes your ever-changing customers are having, and encourage you to partner with brand monitoring companies like Visible Technologies, Techrigy by Alterian, Radian 6, TNS Cymfony, Nielsen Buzzmetrics, Crimson Hexagon, and even simple easy to use tools like Twitter search and Google Alerts. We focus on disruptive technologies, and know we don’t have all the answers, so we want to work with the community. Like the Opensource movement and creative commons, we’re embracing ‘Open Research‘ which means we want to share what we learn so others can build on top of it. We like Creative Commons, and hope you use this content for educational purposes and to share with others with attribution. Stay tuned, as we plan to share more about the socialgraphics methodology and other frameworks. Above: Listen and watch the recoded webinar, there were over 600 attendees in real time, making it interesting to watch the discussion in the chat and in Twitter. Here’s the link that I mentioned comparing Toyota’s shotgun approach and Ford’s laser-like approach. Next, join the conversation in Twitter and beyond, see the many tweets tagged #socialgraphics. Last but not least, thanks to Christine Tran, for her research expertise and rolling out our new powerpoint design. 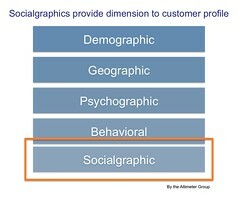 Webinar: Socialgraphics Provides a Customer-Centric Approach to Social Strategy. Left: In the past, marketers have relied on tried and true demographics to understand customers. Now, as consumers adopt social technologies, marketers must measure socialgraphics, which indicates how they interact with each other. Update: Get the slides and watch the webinar: Thanks for attending, with over 800 registered, we’ve now made the Slides and Recorded Webinar available. Beware of plans or proposals that start with “Twitter Strategy” or “Facebook Strategy” Instead, they should have a “Customer Strategy” that focuses in on how customers behave –not on the ever-changing toolset. As a result, companies should first understand how their customers use social technologies before they choose the tools. Socialgraphics is how to measure how customers use social technologies, where they are online, and how it influence them in the context of the customer lifecylce. Where are your customers online? First, find out where your customers are online, knowing which websites they are particiating at, this will reduce guessing.How to make this data actionable: Don’t aimlessly approach social networks without knowing if they are there, if they are in Hyves, Mixii, or Facebook, go there. Fish where the fish are. What are your customers’ social behaviors online? How do they use social technologies? Do they share? Comment? Create their own content?How to make this data actionable: Which social features should you deploy. Example: if they frequently like to comment on websites, allow them to leave their comments. What social information or people do your customers rely on? How to make this data actionable: If they rely on their friends, facilitate a marketing program that encourages customers to share with friends, this data helps with determining resource allocation on advocacy programs. What is your customers’ social influence? Who trusts them?How to make this data actionable: If your customers are trusted by others, highlight your customers in front of their community. For example, teens may share information with each other, spreading their influence to others. Example: Walmart’s 11 Moms blogger program is a platform for customer voices. How do customers use social in context of your products? How do customers use social technologies to learn, make decisions, and support your products and services? How to make this data actionable: Be confident in your resource allocation by understanding when customers rely on social tools or their peers in pre-sales, awareness, decision making, implementation, or support of a product. When properly deployed, Socialgraphics, helps companies, their agency partners, and business units be more effective in their planning and deployment –reducing risk from deploying without having knowledge. In the spirit of open research, we will make this webinar, the slides, and the overall methodology available for the public to use, under creative commons license. We hope you’ll join us. Stay tuned as we have other webinars coming soon. Above: The Engagement Pyramid makes it easy to understand the specific behaviors of socialgraphics, making it simple to decide which technologies to deploy. Having customer understanding makes go-to-market strategy more effective.